What is the difference between the SCA and the condominium associations? Condominium Associations are responsible for the governance and maintenance of their respective properties. SCA, as a civic association, is responsible for improving the civic well-being of Shirlington and concerns itself with civic interests including education, public spaces, streetscapes, transportation, police protection, etc. Who belongs to the SCA? All residents of the Shirlington area as shown on our map, whether they own or rent, and all non-resident owners can be members of the SCA. Businesses located in Shirlington area are also welcome. We are delighted that WETA, the Hilton Garden Inn, the UPS Store, and Federal Realty are all members, along with other merchants in the Village. The condo associations can join as organizations for $100 and will be given 5 memberships which they must designate to specific condo residents (renters or owners). The SCA is not, however, an association of associations, it is composed of individuals and some organizations including most of the condo associations within our area. Thank you to everyone for your support! Which Arlington properties are included in the SCA? See the map. All residents, renters or owners, and businesses within these boundaries shown here are eligible to be members of the SCA. 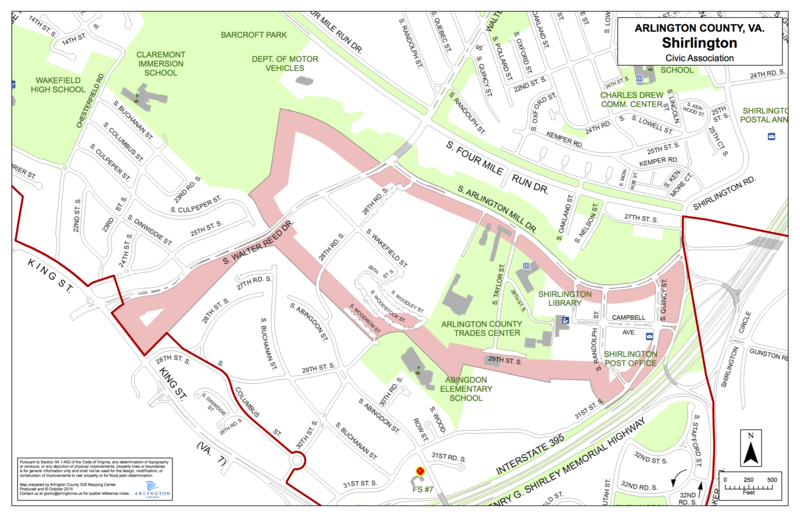 This is the official map approved by the Arlington Civic Federation and then the Arlington County Board in September, 2015, after acceptance by all the adjoining civic associations. Our Bylaws contain a detailed geographic (GIS) description. Please note that Shirlington House is within Fairlington, and the Shirlington Crescent development is with the Nauck civic association boundaries, so residents of these are not, sadly, part of the SCA. Does it cost anything to belong to the SCA? Yes, we are a start-up organization and we really need your dues. Ultimately we hope to move to a business model similar to Fairlington that uses advertising revenue. But for now, our members are our only source of funds. Dues: Individuals $10 each, businesses or organizations $50 each, small businesses $25 each and the eight condo associations $100 and will designate five individuals who can vote. Payment can be made online via PayPal. When does the SCA Executive Board meet? We are so new, we have been figuring this out. The Board meets on the second Wednesday of the month at 3:00 p.m. in — wait for it — the Village at Shirlington! We are currently meeting at Busboys. Any member is welcome – these are open meetings. Email Edie if you want more information. No meeting is planned in December due to the Membership Meeting. How does the SCA represent me? Arlington County depends on civic associations for input, guidance, and feedback on new issues and decisions, and for participation on a wide variety of committees and working groups. The civic associations all belong to the Arlington Civic Federation, an independent not-for-profit that seeks to monitor county needs and develop consensus on important policy proposals. Lacking a civic association until 2015, Shirlington residents have never been able to have a voice in these discussions. Many times we “missed the memo” on what was happening. In 2016-17, the SCA is participating and facilitating community input to the Four Mile Run Valley initiative (4MRV) designing expanded park areas and new uses for the light industrial area along Four Mile Run Drive and up into Nauck along Shirlington Road in the area know as the Crescent. In 2015, the new SCA represented area residents on an important South Arlington Working Group to help Arlington Public Schools select new sites for elementary schools. Among other things, this resulted in the decision to expand Drew Elementary to a full neighborhood school and move the Montessori program to a separate nearby campus. Civic associations also provide channels for residents to improve delivery of county services, fix streets, sort out problems, beautify our surroundings, and enhance property values. I would like to run for the SCA Executive Board. What do I do? Read the SCA by-laws – we have lots of roles for different people. Look through this website, come to meetings. Speak to or email one of the Board members about your interest. The Annual Meeting is in the spring. That’s when elections are held. I am a renter. Can I run for the Board? Absolutely! We’d love to have your energy and talent. One of the best things about a civic association is that it includes everyone, not just owners. Just contact one of the board members and we’ll be glad to have coffee at Peet’s and fill you in. My condominium association refused my variance request. Can I appeal my case to the SCA? Short answer: no. The civic association has no standing in such matters. How do I get attention for an issue that I believe affects the entire Shirlington community? Please raise the issue at a civic association meeting. Right now we have quarterly membership meetings, but Board meetings are monthly except for August. By law, all meetings are open to area residents. The Board would be delighted to hear from you at a meeting. Email the Secretary to put it on the agenda, or show up to make a briefer comment. You can also write a blog post for this website to share your views and information. Please keep it to 600 words. How can I become a member to one of the Arlington commissions? Arlington has many commissions vital to public processes and planning. The Planning Commission, for instance, is looking for new members. So is Parks & Recreation. There are others. Most meet just once a month. If you are interested, the process is simple. Nominate yourself by filling out this form, and reach out to the commission chair. It is a good idea to attend one or more meetings as an observer. The County Board reviews the nomination and, if acceptable, you will be appointed to the commission. You are not specifically a delegate from the Shirlington area, except in the case of the Neighborhood Conservation Advisory Committee (NCAC). NCAC representatives are selected by the civic association and are members of the Executive Board. But please do let the SCA know about your involvement and contribute what you are learning at SCA meetings. Help us monitor developments in the county where we should get involved. It takes a village! Civic Association vs. HOA: Who are you going to call?